What a thoughtful woman you are! 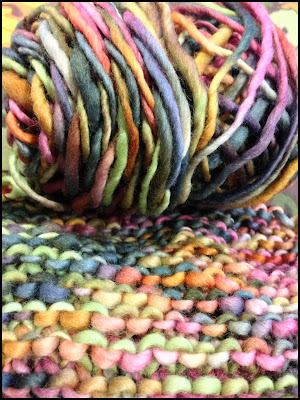 The soft rainbow colours are really pretty - pure unplyed wool? That's really sweet!! I love the colors, it's a nice mix of soft colors! The colours are amazing and the yarn looks so soft! Should be a great cheerful encouragement to your friend. It will bring sunshine to her soul..Beautiful! Karen- these colors are gorgeous--- anxious to see the finished scarf! Is it cold up there??? You have such an eye for color!! Hi I am Kathy and live in the ozarks of missouri-enjoyed visiting your blog and meeting you. Gosh thats such a wonderful mix of colours! This yarn is so amazing. Your friend is a lucky woman indeed. So happy to have met you from Vicki's GYBP! What a great event. I look forward to seeing more from your gorgeous blog. I was a painter 30 plus years. I love how fiber and paint compliment the creative process. Thanks for choosing my needle case! Its prettier in person. Hope you love it!